There are a lot of things about Natalie’s marriage that don’t work, clearly, since they’ve gotten this far into the process. She wants an intimate, emotionally connected, and passionate love. She wants to feel special, heard, and desired in her relationship. She wants to feel alive again. But there are also a lot of ways that their relationship does work (otherwise this wouldn’t have gotten as far as it did). Natalie and Chad always had a lot of fun together and, when they make the space for that, there is always laughter and joy. He’s an amazing father and they do a great job of parenting the children together, and have very similar approaches. When she envisioned growing old with someone, it was always with him. There are also some things that aren’t working in the relationship that are working for Natalie (stay with me here). Natalie says that she and Chad are disconnected, but it feels safe and comfortable to stay tucked into a story so that she doesn’t have to open herself up and be vulnerable with her husband. Staying in that story is actually working for Natalie. Natalie had planned a romantic long weekend away for the two of them a few months ago and Chad declined, saying he had to work over the weekend. That left Natalie feeling rejected and undesirable. That perceived rejection created resentment and a wider gap of disconnection. It’s far easier to stay in that rejection-and-disconnection story than to face potential rejection again and attempt to re-connect with her distant husband. There are pieces of most relationships that work and other pieces that don’t. But there are also pieces that don’t really work, but are somehow serving you. And those are the pieces that are difficult for you to see, because you don’t have the same perspective as someone outside of the relationship. 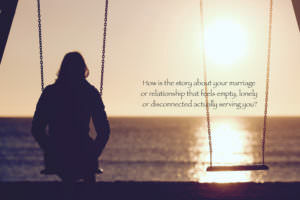 How is the story about your troubled marriage or relationship that feels empty, lonely or disconnected actually serving you?